Over the long weekend of April 30 to May 1 (International Labor Day), low power demand joined forces with strong wind and solar power production. As a result, coal power in Germany hit a record low. But by focusing on coal, we might be missing the big story: the country’s nuclear fleet may have ramped more than any in history. 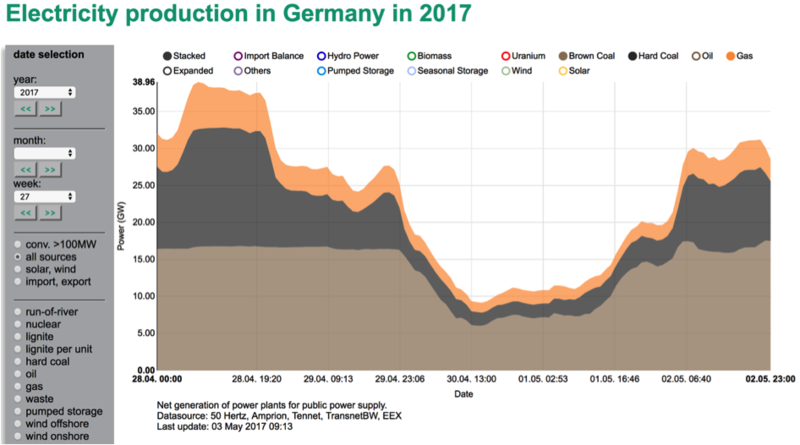 On April 30, a Sunday, German coal power production fell to 7.8 GW. It remained below 10 GW until 11 am on May 1. Wind and solar combined at noon on April to cover 46.5 GW of a mere 71.5 GW of demand. Add on nearly 9 GW of hydropower and biomass, and there just wasn’t much room for conventional power. 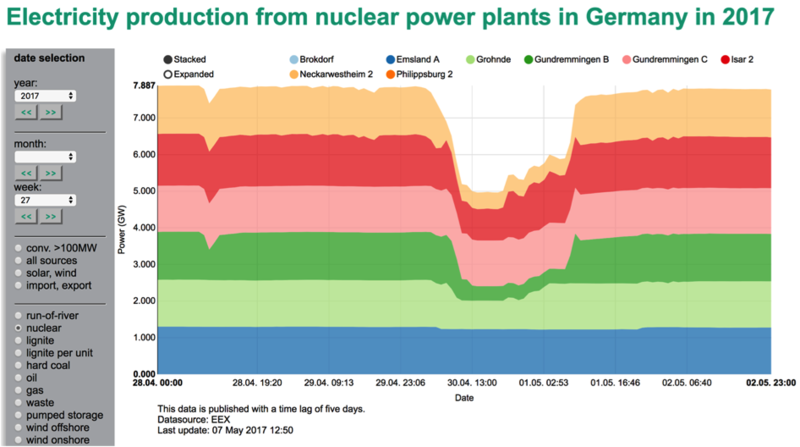 During this lull in the residual load (demand minus renewable power), Germany’s nuclear fleet ramped down from 7.9 GW at 2 am on April 2 to 5.0 GW at 1 pm that day. The fleet thus reduced its output by just over a third. Such occurrences are rare; I know of none worldwide that surpass this ramping significantly (but use the comment box if you know more). Not all of the plants ramped a lot, and two of the eight remaining ones were offline completely. Emsland A and Gundremmingen C didn’t move much. On other days, however, they have, so we know they can theoretically. So more flexibility might be possible from Germany’s nuclear fleet. But it has never exhibited more. In contrast, hard coal dropped from 7.7 GW at 9 PM on April 29 (or 15.6 GW at 8 PM on April 28) to 1.8 GW at 3PM on April 30, while lignite (brown coal) fell from 16.3 GW to 9.1 GW roughly during that timeframe. As always, nuclear ramped less than both coal types and gas. This take is conventional wisdom in Germany but rubs nuclear proponents in the English-speaking world the wrong way. But if nuclear reactors can be more flexible as a fleet, as they claim, why did we still have six reactors running at 60 percent of capacity with the wholesale price at negative 5 cents on May 1 and even lower on April 30? Various reasons are possible. These reactors may be located at points on the grid where they power was still needed (unlikely and hard to demonstrate). They will have had power purchase agreements (PPAs) and not have been exposed to wholesale prices – but the firms running them all were exposed and lost money on the spot market by leaving the reactors on. 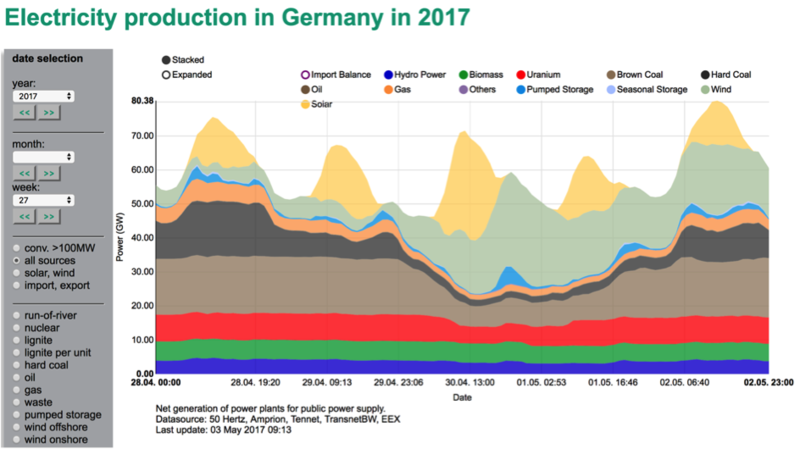 They may have needed to keep output at a high level to provide ancillary services (which wind and large solar also do in Germany, so it’s unlikely that the grid needed help). And finally, and quite simply, they may not have been able to ramp down further for some technical reason, or the plant operators may not have wanted to over concern about technical limits. The reactor at Chernobyl blew up during a test ramp that technicians lost control of. In upcoming posts, I investigate the technical flexibility of nuclear further. Does this matter? The nuclear fleet has five years of life left. If it can’t ramp down technically, and there is no demand abroad, then renewables will have to be curtailed. The only question is who pays and who gets paid. National Grid in the UK have introduced payments to increase consumption at times of excess production. They call it seeking “footroom” for the grid, by contrast with “headroom”.. Producing less electricity is not necessarily Ramping. You can be sure they didn’t reduce the rate of fission and thermal output, and save fuel, they just turned down their electrical output to keep the grid stable, and the energy was wasted. The question is whether it’s now cheaper to keep the nuclear plant(s), or scrap them, build gas turbines, and run them in the evenings. Wouldn’t it be better for our climate to achieve a zero-carbon electricity supply first, before shutting down the civilian nuclear power industry? What are the similarities between the current ramping of German nuclear power plants and the fatal experimental ramping of the Chernobyl power plant? Has been stated before, but for you again – the Germans have had it with nuclear since the 1980’s and the movement from that time is what brought the world a kick start in Solar/Wind. The nukes in Germany are on the way out, no matter how often anyone not from there asks if it would not be better for the climate to keep them running. Well, we should not stop questioning how stupid the actions in Germany are and how hurtful they are to the environment. They even seem proud of not producing clean energy and keeping as much coal and other fossil fuels as possible in the mix. The whole energiewende is just sad. Imagine if they had put that effort toward getting rid of fossil fuels. It is perfectly reasonable to shut down nuclear, but my question is more why Germany is still subsidizing coal? It seems also that it decided to shut down renewables growth, in order to protect its lignite. All major parties are staunchly pro-coal, German politicians are fighting against renewables in Brussels and Strasbourg. Germany is the main force behind current slow down of energy transition. Thanks for highlighting the atomic ramping. From what I heard the atom power plants in Germany can ramp only by 10% down, if they go for more the strain on material would be to bad (“accelerated aging”). But maybe that doesn’t matter anymore to the owners ……. It seems to me as an outsider that the political influence of the old power industry is not that big anymore as it used to be.